So a few days ago i received a lovely little packages of goodies which i am overly excited about to share with you all. 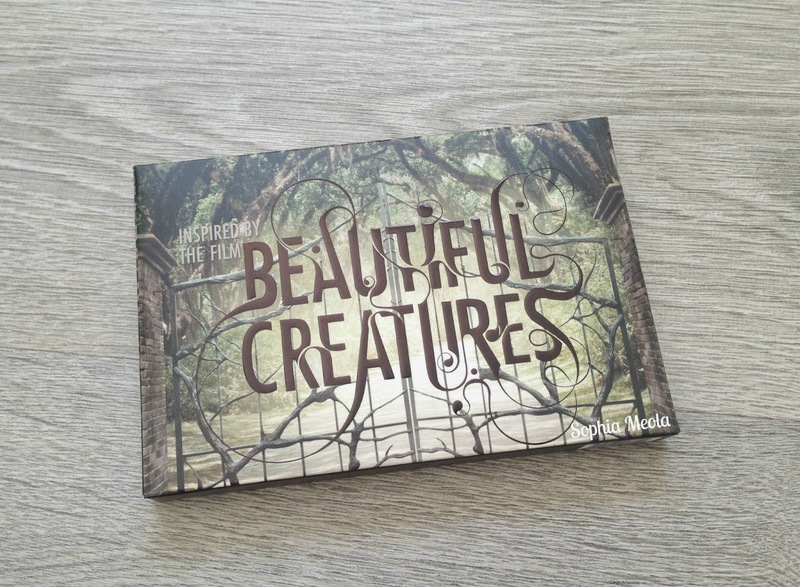 Amongst all of the goodies was this absolutely stunning 'Beautiful Creatures' palette by Pur Minerals which was inspired by the recent film and book series. I literally had the shock of my life because it is such a beautiful palette... packaging and products wise. I really couldn't be happier! 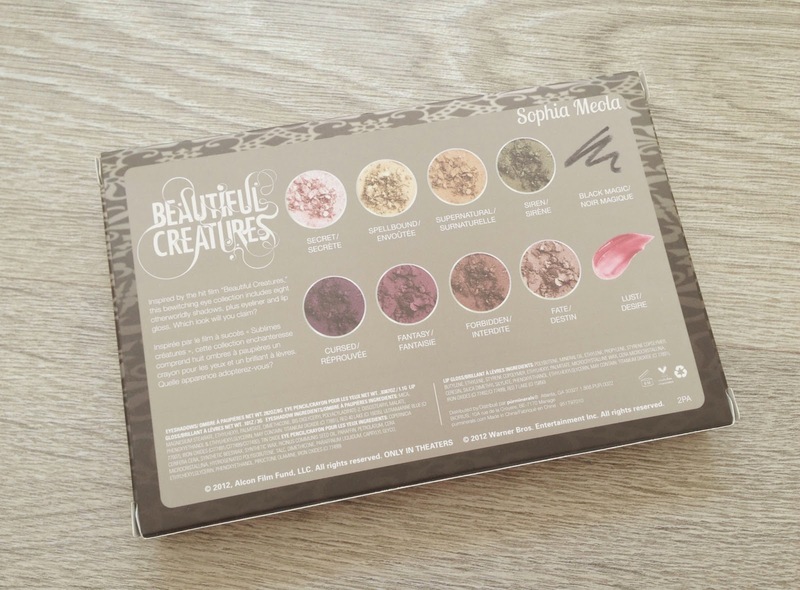 To coincide with the release of the 2013 film 'Beautiful Creatures', Pur Minerals teamed up with Warner Bros to release a limited edition eyeshadow palette, inspired by the film and the book series. 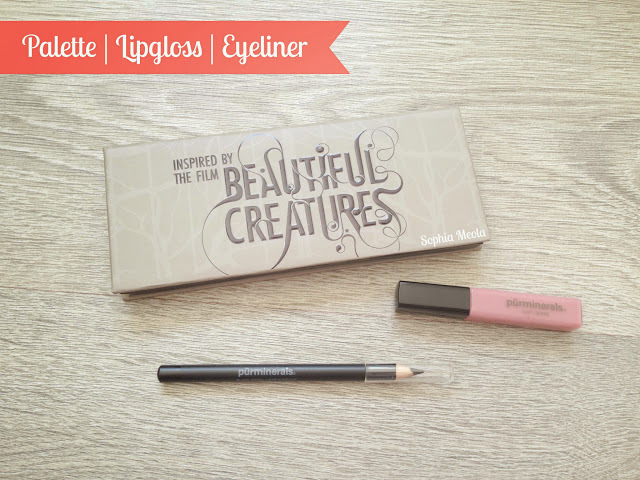 The palette includes 8 beautiful eyeshadows, a pretty lipgloss called 'Lust' and a black eyeliner pencil in 'Black Magic'. Such fabulous names! Firstly the packaging is absolutely beautiful! The detail one the front and the back is so lovely and it was one of the first things i noticed as it is really bold and has so much detail. The detail on the gate reminds me of the film instantly, which i'm guessing the whole idea behind it as it has meaning in the film. Might i add i absolutely loved the film and have seriously watched it a good few times now! What do you think about it? 'Forbidden' reminds me of a MAC Mulch shade, 'Siren' MAC Sumptuous Olive, 'Fate' Urban Decays Moondust Eyeshadow in Space Cowboy except this has less sparkle, 'Secret' MAC Shroom / Naked Lunch and 'Cursed' MAC Beauty Marked! What do you think? Anything remind you of one of your fave eyeshadows? The included Lipgloss is also lovely, if you read my blog then you know my obsession with pink lipglosses, so this will go down a treat haha. The eyeliner is surprisingly pigmented, i know with other special edition palettes you can get kind of dodgy eyeliners that scrape your eye and literally leave nothing behind when applying them, so super impressed with that. Lastly, the included eyeshadow brush is really lovely! It reminds me of a MAC 239 and applies the eyeshadows great. There was no fallout at all when using the eyeshadow brush which is great because yet again special edition palettes can comes with useless brushes that pick up no product at all haha...anyone else had this problem?! The thing i really love about this palette is the fact i really like every single shade of eyeshadow included. I'm quite fussy and unless i've built my own eyeshadow palette it's rare to find one you love all of the shades included. I can really see myself utilising this palette on a daily basis and for dramatic evening looks. The colour combinations so so well together, so you can literally mix up the shades and create an array of different looks. This is the first time i have tried Pur Minerals Eyeshadows and i am absolutely loving them and i cannot wait to browse through their website and see what else i can try haha (Shopaholic). 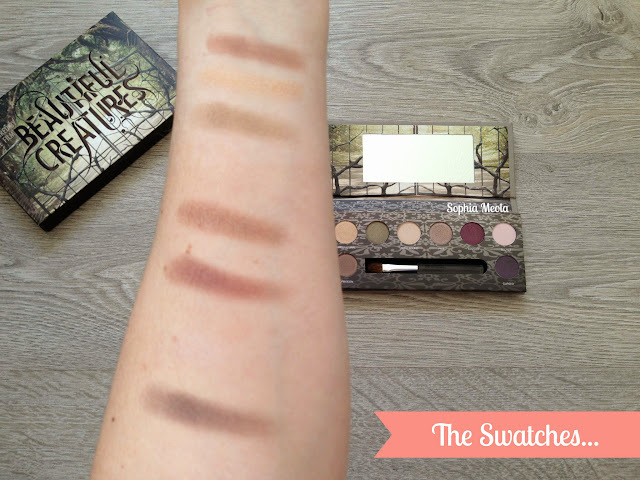 Overall, i feel Pur Minerals have done an amazing job with this collaborated special edition palette! The little extras plus the beautiful eyeshadows make this an fabulous purchase. 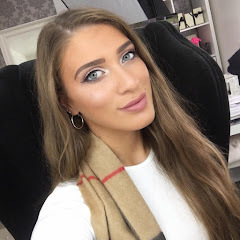 If you would like to get your hands on a palette you can go straight to the 'Pur Minerals' website and take a peek at all the goodies and this listed palette. Unfortunately, as the palette was created exclusively in the USA it is not available to purchase here in the UK. I hope you enjoyed this post i would love to know your thoughts on the palette :D would you be create a light or dark look...haha get it ;) If you have any questions or request please do not hesitate to contact me or leave a comment below! This palette is sooo beautiful, love the packaging! So weird! Just finished watching that movie then seen this post.. Hoping they do a sequel wasn't too keen if it were to end like that! It reminded me of True Blood because of the accents then Twilight in the eyes of Edward instead of Bella! I did enjoy the film tho. I like the colours in the palette aswell quite gothic and mysterious! I love this palette, all the colours are so pretty! Cursed, Supernatural and Fantasy by sight being my favourites. And being really pigmented, I'll definitely think about getting this. I've not seen the film, but I would buy this just for the colours! 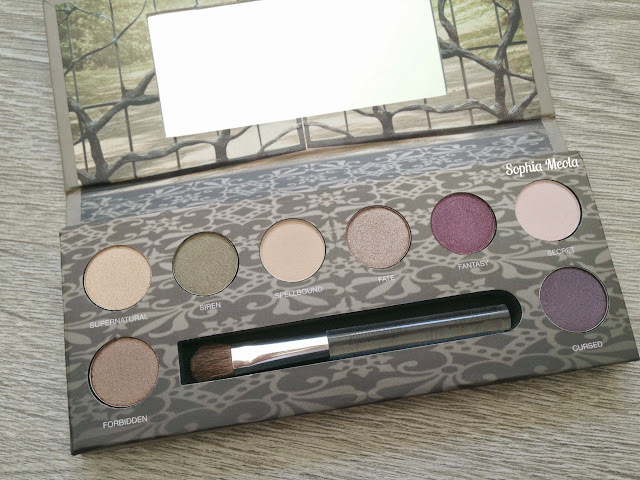 This palette looks really cute the shadows and the packaging look really cool. Everything about this palette is so pretty ! Such a beautiful palette! Wish this was available for the uk!!! I love the look of that palette, such great colours. And thanks for visiting my blog - I'm now following yours and hope you'll return and follow mine too. And don't forget to enter my INTERNATIONAL GIVEAWAY too..